WMS is synonymous with land-based slot machines. If there's a US casino, there's probably a bank of WMS slots propping it up. But despite the fact WMS have been around for 70 years they still know how to innovate, and many of the biggest online casinos carry several Williams titles. 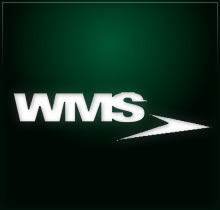 If you want to see what the fuss is about, try out some WMS slots for free on our page. Williams Industries started out life in 1943 by Harry E. Williams as a pinball manufacturer primarily. The firm has gone through various name changes in its life, beginning as the Williams Manufacturing Company, before Williams Electronics Inc was founded in 1974. Subsidiaries Williams Gaming (1991, later WMS Gaming in 1999) and Williams Interactive (2012) were formed to oversee the production of slot machines and gaming machines. The new Williams Gaming division started producing video lottery terminals in the early 1990s before moving into the slot machines business. 1996's 'Reel 'Em In' slot featured a classic-style three-reel set-up but with up to seven progressive jackpots linked across casinos up for grabs. While those 'local area progressives' proved popular in the US - where WMS enjoyed access to around 70% of America's slots players - the developer's 'Wide Area' games have been the real draw. MONOPOLY Grand Hotel Big Event and Triple MONOPOLY have been responsible for some massive winners in recent years in the US, while big-name tie-ins like The Wizard of Oz with 'Transmissive Reels' technology (a video screen over mechanical reels) the firm has managed to combine new 3D animation with the classic Vegas-style one-armed bandits. While Barcrest - another formidable land-based developer - and WMS were once rivals, they were brought under one umbrella when Scientific Games bought out WMS Industries in 2013 (SG having already acquired Barcrest two years earlier). WMS was bought for around $1.5 billion in cash as part of the deal. Monopoly fans can enjoy the recent Super Monopoly Money slot, developed after WMS acquired the Monopoly brand from IGT (not to be confused with Barcrest's Monopoly Big Event). Similar in some respects to Barcrest's game, Super Monopoly Money features the usual slots fare like expanding Wilds and free spins, but also makes full use of the Monopoly board game features. A special 'Monopoly Money' bankroll can be added to with subsequent Wild wins. This cash can then be used to the spin the Monopoly Money wheel to bag big jackpots up to 100x your total stake. Rather less confused is the popular Bruce Lee slot. Played over five reels (made up of a two 2-row reels and three 4-row reels), Bruce Lee forms part of the 'Money Burst' range of slots. There are 60 paylines in total and the game comes with stacked Wilds. Land-based casino buffs will recognise The Wizard of Oz, based on the classic Hollywood movie. The slot made a seamless transition to the online casinos recently, and the game features free spins and a truly immersive "journey" as you pick up characters from the film and move through the bonus levels on the way to the Emerald City. Whether you're into some classic Hollywood fare like The Wizard of Oz, or into some unique reel action with Bruce Lee, WMS's online games are as slick and exciting as their land-based cousins. Try out some top jackpot slots from Williams today by clicking on the links on this page. We have a healthy range for you to try the games out for free.